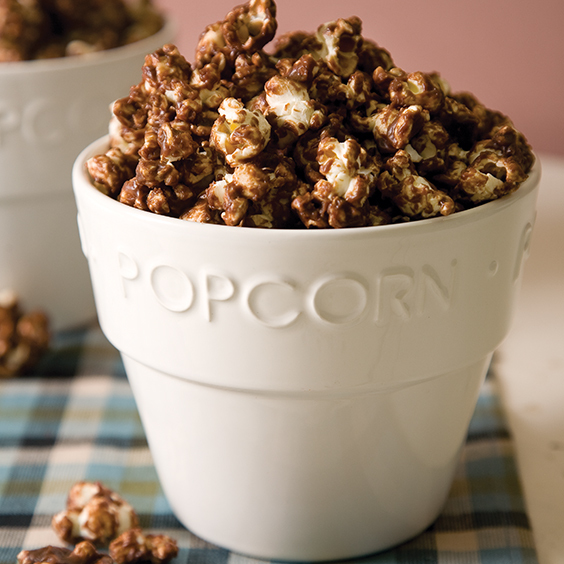 Enjoy the sweet taste of chocolate, brown sugar, and vanilla with this yummy popcorn treat! Place popcorn in a large roasting pan. In a large saucepan, combine butter, brown sugar, and corn syrup. Bring to a boil over medium-high heat; boil for 5 minutes. Remove from heat; stir in chocolate, salt, and vanilla. Let stand, stirring occasionally, until chocolate is melted and smooth. Pour over popcorn, tossing gently to coat well. Bake for 30 minutes, stirring occasionally. Pour popcorn in an even layer onto parchment paper. Cool completely. Store in an airtight container for up to 2 weeks.